William LeBaron Jenney’s Home Insurance Building stood at the northeast corner of LaSalle and Adams streets. As the world’s first iron-and-steel-framed building, it heralded and made possible a new era in tall buildings. It was arguably the world’s first skyscraper, though that distinction is debated among purists. 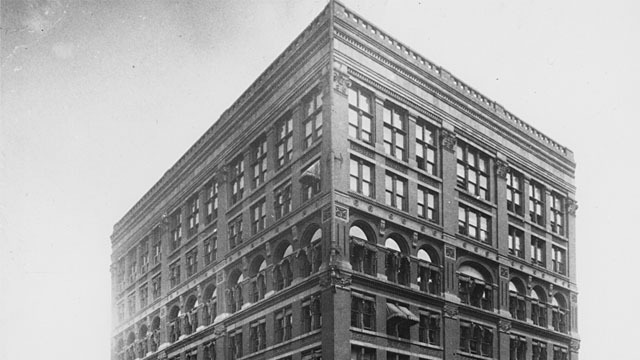 Jenney’s structural engineering innovation meant that a building’s exterior masonry walls no longer had to be “load bearing,” alleviating the need for massive masonry foundations such as on the Monadnock Building or the Auditorium Building. The Home Insurance Building was demolished in 1931.